Meanwhile, while I was busy playing New Leaf, I would sometimes check up on my Wild World town, but I’d always set it to that same date (February 25th). This way I could walk around town in its practically flawless state (no wilted flowers), enjoy the sights of town and the gardens I’d worked hard on (without having to actually water any of them), and talk to my neighbors (without them being mad at me for my long absence, or God forbid, find out one of my favorites had moved out!). I hope you can understand why it was so tempting to just keep my town on the same date — I could still enjoy “visiting it” every once in a while (it reminds me of the concept of visiting dream towns in AC:NL), but I wouldn’t have to do the daunting task of catching up my town to the present, or worry about maintaining it. Because that’s the thing about AC:WW: if I started playing it normally again, I’d have to do work every single day just to keep my town how it currently is. There’s no Beautiful Town Ordinance, so if I don’t water the inevitable wilted flowers, they’ll be gone the next day. Anyway, now that you know why it’s still spring and green in my town, I’ll share some pictures from my “visits” to Dafdilly since New Leaf came out! I guess I’ll feel better letting Whitney go (if/when she packs up), now that I have her picture. I consider Eloise my dream snooty for Dafdilly, but who knows if I’ll ever get Dafdilly’s dream neighbors at this point. xP I’m probably closer to getting my dream neighbors in Citalune! Static’s been saying this a lot. Good to know he’s loyal, I suppose! Haha wow, might be getting a little extreme there Melba! 😛 But aww, it’s appreciated. ❤ You can tell that there's some special dialogue in AC:WW from neighbors you have a high friendship level with. Today (December 26th) I finally decided to set the date in Dafdilly to the day after the first day of Spring (February 26th). Why? I dunno, I guess the same reason why I made this post: I felt like it. 😛 I might end up regretting it later, since now there are wilted flowers and fossils and things I have to deal with. I got a letter from Apollo saying that he moved! Which surprised me, since I didn’t remember him being packed up the day before. I don’t really mind, though; I don’t consider him a “dream” (permanent) neighbor for Dafdilly. Well, goodbye Apollo! The house belongs to my new neighbor, a cow named Tipper! Ah cool, so she’s from Jemma’s town! 🙂 I guess she’s been waiting in my ninth slot, ready to move in, for months! Wow, a throne! 😮 But it’s expensive, and I already have one thanks to Jemma’s giveaway, and maybe also another one from Wishy the Star or something like that. Ooh, a neighbor locking opportunity! I think it would be great to lock both Puddles and Melba in town, Melba of course because she’s my favorite neighbor, and Puddles because she was one of the three original neighbors in Dafdilly. So I delivered the present to Melba but didn’t report back to Puddles. But then I remembered that it’s best if you do this sort of thing with an alternate character instead of your main (so that you don’t accidentally complete the errand when you’re talking to villagers with your main character). Oh well, I’ll see if I can keep this Puddles-Melba lock-in going on for a little while anyway! 1) Casually progress through time in Dafdilly, whenever I feel like it. 3) Catch up to the cherry blossom festival, since that’s something I’ve always wanted to experience in Dafdilly, do a special landscaping project for the pink trees, and then just keep it on that date forever. 4) Put away most of the flowers in Dafdilly, so that it’s less of a pain to water them. This might make playing AC:WW daily or near-daily more feasible. Not sure which option I’m going with, but yeah, it’s possible that I’m not completely done with Dafdilly yet! 😀 It’s not my #1 priority either, though! Posted on December 26, 2013 by Amy •	This entry was posted in AC:WW, AC:WW WiFi, Dafdilly and tagged Animal Crossing. Bookmark the permalink. Ahh.. your town is so much nicer than mine 🙂 all i did was plant random flowers everywhere XD though your beach looks a little like mine..
i love your path too! yeah.. At the time I started blogging about WW, I had practically finished with it. The last upgrade for nooks, all the golden tools, full house, yeah.. I only kept playing because I was waiting for new leaf. I agree, the simplistic charm (along with general nostalgia and fondness for my town and AC:WW) is part of why I was thinking/hoping about maybe returning to it a bit. I’m glad that you don’t hold the lack of many real-life holidays against Wild World (many do)! Because I agree, I think holidays are a fun bonus, but they aren’t the main reason why I play AC, and I think Wild World had some fun events here and there like the Flower Fest, Mushroom Festival, Bright Nights, Flea Markets, and so on. Aw, so nostalgic! Dafdilly is such a cute town, and I was recently wondering if you’d ever do another post about it again. I’m glad you did, it feels so good to hear bout it! If I were you, I’d have kept it on that date forever, to be honest! Yeah…no watering, fossils, neighbours leaving…but it is good to keep moving, I guess. Ugh, headache. Gosh, Melba. You sure like friendship! The breathing the same air comment is weird…yeah. If you did put away all of the flowers, at least you have the grid map you made of where each one was if you wanted to put them back. Sea Cove is positively drowning in flora, because I covered it in roses, lillies and tulips, in a way to ensure hybrids – y’know, the kind of diamond formation? Except I need fertiliser right now…it’s going sluggishly. But visitors get bowled over when they see. It’s funny. I’m glad you liked it even though there wasn’t anything terribly eventful in this post 🙂 And I’m surprised you understand the appeal of keeping my town on the same date — I figured that would seem strange to most people! 😛 But yeah, it’s nice to be able to check up on my WW town without having to do any of the maintenance. But it’s also of course nice to be able to progress through time and see different events and seasons and such. I miss it as well! But it makes me feel a bit better that I can still “visit it” (even though the date isn’t correct). Aww, that comparison of last year vs. this year was beautifully said! x3 I can relate; this time last year I was probably busy working on my candy theme for Wild World, and this year I’m busy working on my New Leaf town instead. Thank you very much for saving me the berliner, and for the well wishes! 🙂 I hope you have a great new year as well Sophie, and that 2013 will be a wonderful year for you! 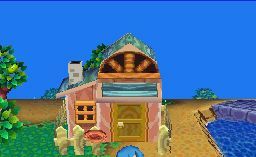 Can you lock neighbors in New Leaf?